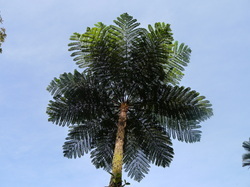 This project leverages the latest molecular genomic techniques for conservation of the cycads, which are the most endangered group of plants alive today. Cycas (Cycadaceae) is the most diverse and widespread of all the cycad genera, and all Cycas species in Australia are endemic with one-quarter of these endangered or vulnerable. The overarching goal is to provide genetic data for conservation to identify the most genetically diverse populations and target these populations for in situ conservation; and determine if ex situ collections sufficiently represent the genetic diversity in the wild. 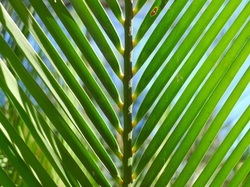 With 107 species, Cycas is the most diverse and widespread of all the cycad genera. Currently, Cycas is segregated into six sections; however, at the time of publication, Hill (2004) noted that “placement of a number of species… is uncertain”, and that the classification was an “informal interim arrangement”. To assist in the conservation of this iconic but threatened group, a modern phylogeny and classification are needed. For this project, new DNA sequence data for all species﻿ are being generated for a new phylogeny and morphological characters are being reviewed. The molecular phylogeny and morphological data will then be used to produce the first comprehensive infrageneric classification for the genus. 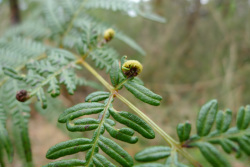 Ferns are the second most diverse group of plants in Australia, after angiosperms. They have a wide range of habitat preferences and are widely distributed, thus they are an ideal group for understanding diversity and endemism. In this study, diversity and endemism were assessed across Australia using standard taxon-based metrics and phylogenetic indices, identifying critical regions for conservation. A similar conifer project is also being completed. Bracken grows worldwide and is toxic to many mammals. However, in Australia the flies Scaptodrosophila megagenys and Scaptodrosophila notha use bracken, Pteridium esculentum, during their larval stage -- suggesting that these flies have evolved counter-defenses. Our goal is to conduct a population genetic study of bracken, Pteridium esculentum, and the two fly species in order to identify regions of the genome that have been the targets of evolution caused by interactions between the plant and herbivores. Ferns and flies were collected together with Dr Noah Whiteman and Dr Rick Lapoint in 2013 as part of a grant supported by the National Geographic Society. To learn more about the field trip, visit the Expedition to Australia blog. Living research collections are being maintained at the Royal Botanic Garden Sydney, they cover the latitudinal gradient of Pteridium esculentum in Australia, and all continents in the Northern Hemisphere where Pteridium aquilinum occurs.